Oman, where I have spent the past week, is an Arab country unlike any other. Count the ways. The nineteenth-century Omani sultan's palace in Zanzibar. Islam has three main branches: Sunni (about 90 percent of all Muslims), Shiite (about 9 percent) and Ibadi (about 0.2 percent). 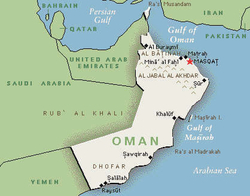 Oman has the only Ibadi-majority population in the world. Being a tiny minority in the larger Muslim context, rulers of Oman have historically kept away from Middle Eastern issues. Part of the country was isolated mountainous desert terrain, part was focused on the seas, especially on India and on East Africa. For two centuries, the Omani empire competed with the Europeans for control of the Indian Ocean; indeed, Oman ruled the African island of Zanzibar until 1964, making it the only non-European state to control African territory. Note the separate Musandam Peninsula portion of Oman north of the UAE. This unique remoteness from Middle Eastern problems, whether it be the Arab-Israeli conflict or Iranian expansionism, remains in place. At present, with a civil war raging in next-door Yemen and Iran making trouble right by Oman's Musandam Peninsula, which juts out into the super-strategic Straits of Hormuz, Oman is an oasis of calm. Jihadism has so far been non-existent, with no acts of violence in Oman and no Omanis joining ISIS. The bifurcated desert-sea nature of Oman has induced a tension between cosmopolitan worldliness and insularity. The ruler from 1932 to 1970, Said bin Taimur, went to school in India and Iraq, then visited Franklin D. Roosevelt in Washington; he also educated his son Qaboos bin Said abroad. Despite this, Said kept Omanis isolated from the outside world, squirreled away oil revenues, and perversely thought isolation and backwardness would assure his continued rule. Symbolic of Oman's standing in 1970, it had a grand total of 2 electricity generators, 2 hospitals, 3 private schools, and 6 miles of paved roads. Slavery was legal; smoking in the streets was not. Not a single newspaper or movie house existed. As one visitor put it, "the clock of history was stopped somewhere in the Middle Ages." It turns out that poverty and ignorance did not assure his continued rule. In July 1970, the 30-year-old Qaboos overthrew his father in a palace coup d'état; 47 years later, Qaboos remains Oman's absolute ruler. He turned out to be a relentless modernizer who personally oversaw the building of the country, from oil refineries to an opera house. About a million barrels a day of petroleum sustains the economy without overwhelming it; two and half million Omanis employ about two million expatriates, largely from South Asia. Omani beauty: A Portuguese fort in Muscat. A once-closed country is now easy of access; US$13 buys a visa at the airport and Oman's natural beauty has made it a destination for high-end Western sun-lovers and eco-tourists. It's become so chic, Lonely Planet in 2012 listed the capital Muscat as the second "best in travel" city in the world. As a result, the country has largely caught up, boasting electricity in the most remote villages, an extensive network of excellent highways, 91 percent literacy, a network of colleges, and the Royal Oman Symphony Orchestra. A benevolent dictator, Qaboos dominates the country in ways alien to a Westerner. He serves simultaneously as prime minister and minister of defense, foreign affairs, and finance, as well as supreme commander of the armed forces and police. Nor is that all: as the Economist has noted, on an average day a resident of Muscat "is likely to drive down Sultan Qaboos road, pass Sultan Qaboos Grand Mosque and perhaps Sultan Qaboos port, too. He or she may be a graduate of Sultan Qaboos University and watch a football match at the Sultan Qaboos sports complex before heading home to a house in Madinat Sultan Qaboos, a neighborhood of the city." The Arab insurgency that began in 2011 reached Oman but, as in the case of most of the monarchies, was easily handled with some extra spending. Mar. 3 saw the country's biggest news in decades: the 76-year-old Qaboos, sick, frail, and childless, appointed a cousin, Asaad bin Tariq, as deputy prime minister, a step widely interpreted as indicating his choice for successor. After years of speculation, this designation, with luck, will stave off lurking instability. 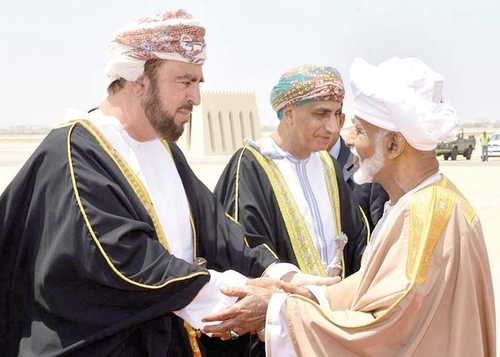 Sultan Qaboos (R) greets his apparent successor, Assad bin Tariq. As a democrat, I rue absolute monarchies. As a Middle East analyst, however, I acknowledge that monarchies govern far better than the region's alternatives, mainly ideologues and military officers. I therefore join many Omanis in hoping for a smooth transition that keeps the country deftly out of harm's way. Apr. 24, 2017 update: The price of a tourist visa to Oman just quadrupled.